Say Hello to Team Bark + Ride! Whether you’ve heard the name, seen our product in a bike shop near you or seen a friend wear our gear, the great news is, the word is spreading fast! 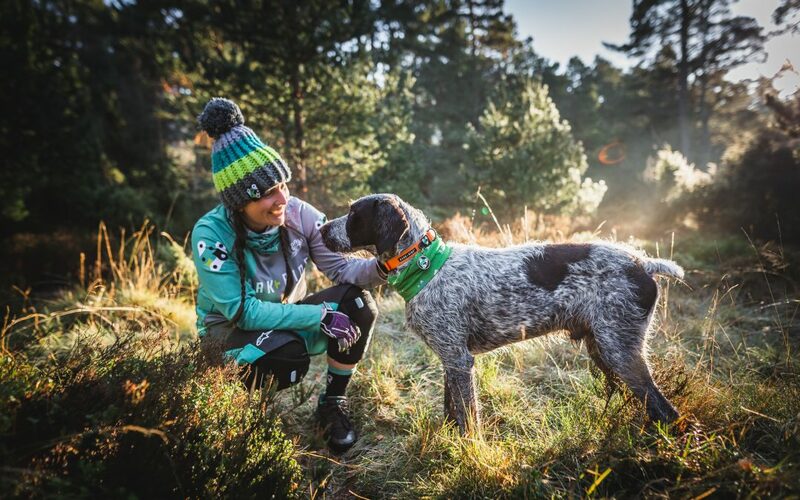 The Bark + Ride brand is growing to be the UK’s fastest growing outdoor lifestyle brand for active people and their dogs! that said.., I thought it was about time I properly introduced myself! 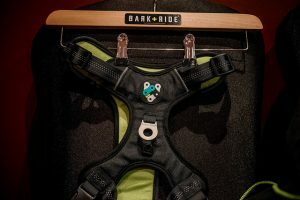 Hey, I’m Kaz and I’m the founder of Bark + Ride! Around 8 years ago, my passion for mountain biking was ignited when I got my first hardtail, a Specialised Hardrock. 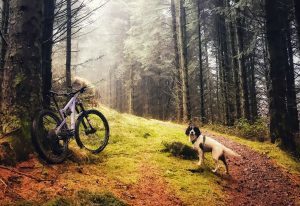 I loved it and couldn’t wait to go on a ride, it didn’t matter where or when, as long as it was with my new found friend for life- Lewis, our English Springer Spaniel pup. He gave me the confidence and encouragement I needed to get out the door every weekend to a new place, trial a new section of trail or push that little further beyond the next hill. I soon realised we both loved sharing the adventure. He loved the speed and the chase of the trail. I loved seeing his bright eyes and wagging tail patiently waiting on me ahead whilst I struggled uphill. We slowly but surely built up our adventures, from our local trail centre at Carron Valley, to long weekends adventuring away and a two man tent. We shared the same chilly morning starts, wet paws and soggy shoes, campfire cuddles and the next day we’d have fist bumps and high fives after discovering the best descents in new found places and get a surprised smile from hillwalkers or other cyclists who saw how happy the two of us were together. I soon began to realise there must be others like me that have this passion to bike with their dogs, and I was right! Starting up a small business really isn’t as easy as some folk might think, especially when juggling a full-time career, a change of home and a new relationship. The struggles are real when the scales don’t quite balance. Too much time worrying about funding and financials, not enough time building social media content and the never-ending push for the perfect product drawing, exactly how you want it to be, teamed with the desperate want to get out on your bike and do what makes you feel the best. Luckily I had the right support mechanisms around me and living near Glasgow at the time, I had a fantastic opportunity to seek the amazing support from specialists within DMBinS, Edinburgh Napier University- Mountain Bike Centre of Scotland, Strathclyde University and Business Gateway to name but a few. Without this support I doubt I would be where I am today. 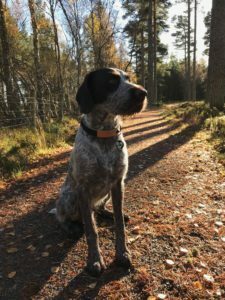 Enter – Harris, our now 1-year-old German Wirehaired Pointer. My partner and I decided since Lewis was the family dog and was starting to slow down a little from trial dog life, we could think about getting our own dog! And what a choice we made! This boy is faster than a speeding bullet. You can hear him galloping behind you like a racehorse, blink and he’s half a mile away. In true German Wirehaired Pointer fashion, he’s a speed demon and a hunting machine. A beautiful dog, an excellent trail dog in the making but by god, he is hard work. We love him to pieces, he gives us our daily challenges and all I can say is, he’s so worth it! The perfect dog for speed and longer days on the trail but don’t be fooled, he is a tough egg to crack and pushed our ordinary practices of training to an all new level. And what about Lewis, my very own dog, the heart, soul and spirit of the Bark + Ride brand! Although he may not get out as much as he used to, it is because of this awesome traildog that I was able to find the inspiration to design some of our most exciting new products coming in 2019. 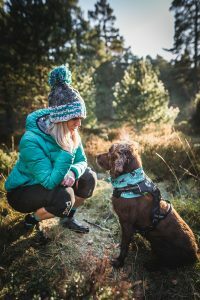 Our Lewis Adventure Harness, as featured in Singletrack magazine, dropping late February amongst some other really exciting products, is part of our collection, dedicated to inspiring others to get out there and share their traildog adventures. We’ve had some amazing opportunities in 2018 to help spread the awareness of our product and brand. 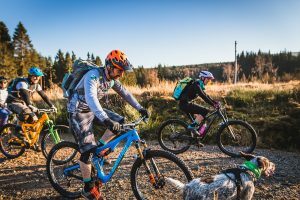 Aviemore hosted the Scottish Mountain Biking Conference organised by Developing Mountain Biking in Scotland, where we had the opportunity to pitch our products to media from all over the world. 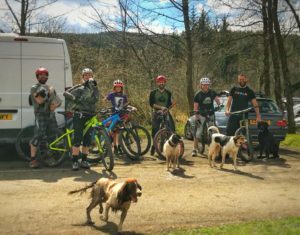 Bark + Ride Outs, an important part of who we are, came from the immense support from our local riders, some travelling as far as Edinburgh and the Scottish Borders to join in the fun! Location- Carron Valley, Summer 2018. The response from all of our followers and new found friends have been remarkable and i’d like to personally thank you all. 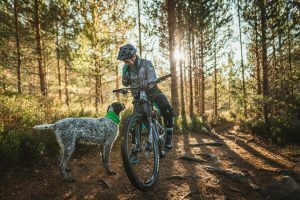 There isn’t a day that goes by where we don’t get an email or comment about our product that makes me want to do it all over again, as happy as ever that I’m inspiring other riders to find the positives both mentally and physically that can be gained from a canine companion on the trail. Not only do our fellow riders and new found followers help us spread the word of this ever-growing Scottish brand, we now have our fantastic team of Ambassadors and Ambassadogs to thank for being able to spread the word and share the same passion that we have! In our next blog, we will be introducing a few key players in our Ambassador Pilot Scheme that helped make this brand what it is! 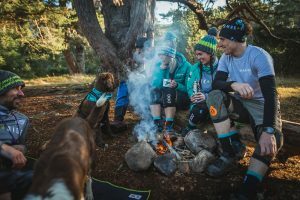 We will meet Debbie with her traildogs Roxy and Rapha as they give us some top hints and tips about traildog etiquette! Debbie having a pep talk with Roxy.